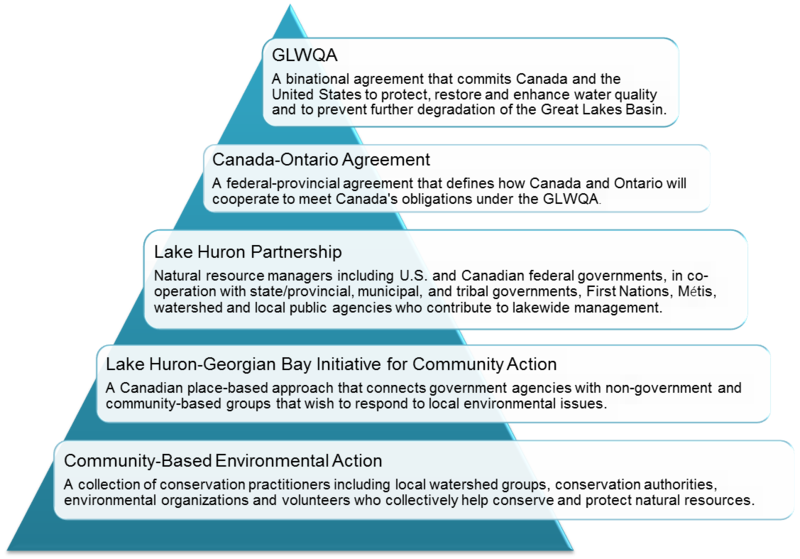 In 2005, 30 to 40 individuals from Canadian provincial and federal agencies, First Nation, county, municipal and environmental/non-governmental organizations agreed on the need for a unifying vision and approach to improve collaboration for an integrated domestic approach for the Canadian portion of the Lake Huron watershed, and to empower communities and individuals to take action for the Canadian portion. 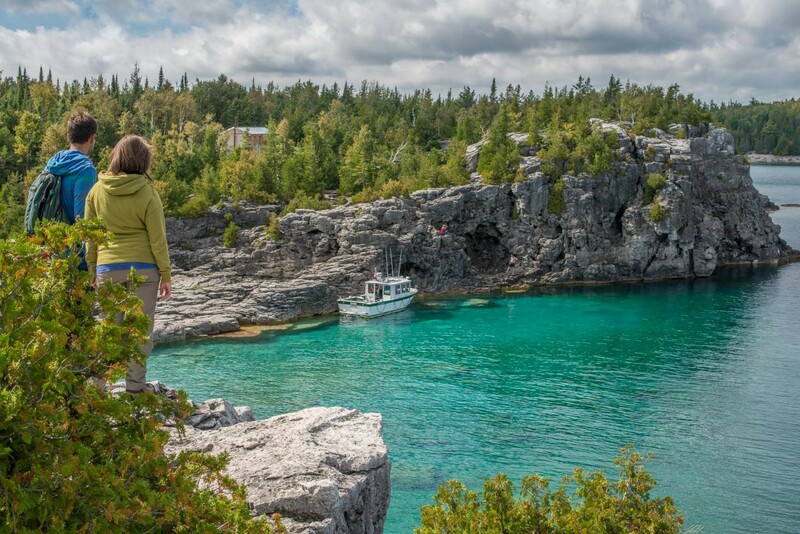 Individuals, communities, municipalities, watershed groups, businesses, academic institutions and government agencies are all working on solutions to environmental issues around Lake Huron and Georgian Bay. With a watershed this large, water quality management surpasses legal and political boundaries. As a result, the health and care of Lake Huron requires a diverse network of collaborating and supporting agencies to guide restoration and protection efforts. A number of Acts, Agreements, Lakewide Management Action Plans, and watershed initiatives guide governments, communities and individuals in their efforts to address the most pressing environmental challenges. Community-based groups and local environmental organizations are the foundation of successful restoration and protection efforts throughout the Lake Huron watershed. They participate to identify issues and needs, and are the most effective champions to achieve environmental sustainability in their own backyards and communities. Developed in 2007, the Lake Huron-Georgian Bay Watershed: Canadian Initiative for Community Action represents a collaborative effort to address complex environmental issues. 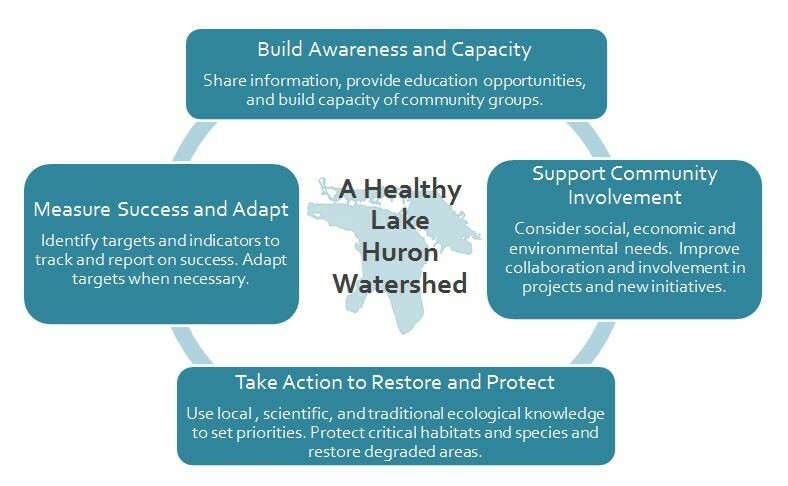 This approach is based on the idea that individuals, communities, and organizations in the watershed operate independently, but form a stronger force united by the common cause of maintaining, restoring, and protecting Lake Huron. 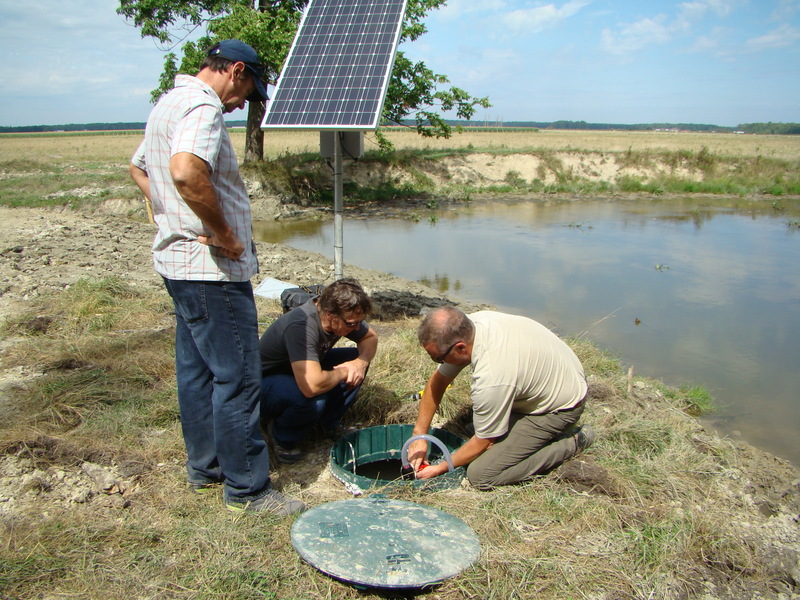 Promote local restoration and protection initiatives that can be adopted and implemented across the watershed. 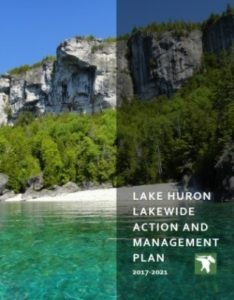 The public-friendly document contains a Charter and Vision to help unite efforts in the watershed that protect and restore Lake Huron. A set of principles promote and guide collaborative, science-based approaches that align individuals, communities and government agencies in taking effective conservation and protection actions to achieve lasting results. Read the complete Lake Huron-Georgian Bay Watershed: Canadian Initiative for Community Action report. The Lake Huron Partnership consists of over 25 federal, state, provincial, municipal, tribal and First Nations government representatives and watershed management agencies working in Canada and the United States who jointly determine priority science, monitoring and management actions to protect and restore the health of Lake Huron. 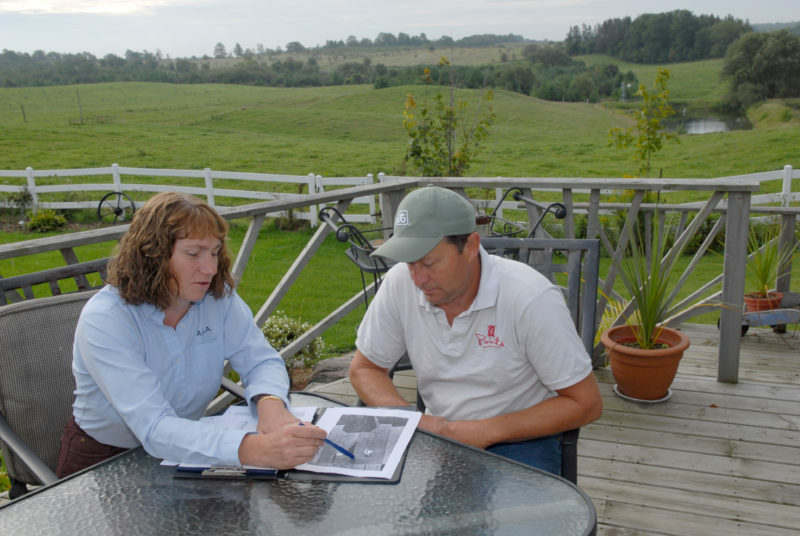 Lakewide management is guided by commitments pursuant to the Great Lakes Water Quality Agreement and sets out an integrated, adaptive management approach. The Partnership is responsible for the development of a Lake Huron Lakewide Action and Management Plan (LAMP) and other binational strategies. Access the full Lake Huron LAMP document at www.binational.net. 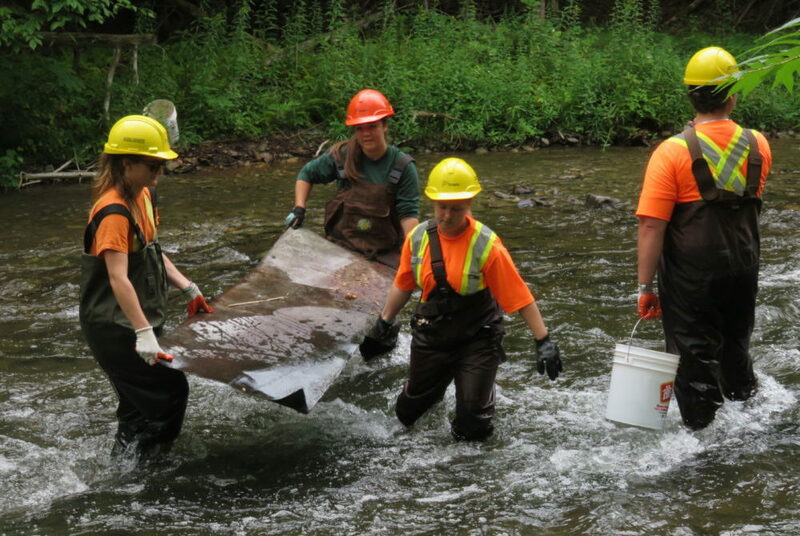 The Canada-Ontario Agreement on Great Lakes Water Quality and Ecosystem Health is the federal-provincial agreement that supports the restoration and protection of the Great Lakes basin ecosystem. For more than 30 years, the Canadian and the Ontario governments have worked collaboratively and with other partners. The Agreement is the means by which Canadian federal departments interact with the Ontario provincial ministries to help meet Canada’s obligations under the Canada-US Great Lakes Water Quality Agreement (GLWQA) . Provincial agencies are hard at work and Lake Huron is represented by a provincial Lake Advisor and COA Coordinator. For more information, access the Canada-Ontario Agreement on Great Lakes Water Quality and Ecosystem Health (2014). Both Canada and the United States and their neighbouring states and provinces have worked together for decades to protect and restore the integrity of the waters of the Great Lakes. We would be hard pressed to find any other example of long-standing and effective collaboration between nations. The Great Lakes Water Quality Agreement (GLWQA) is an agreement between Canada and the United States, first signed in 1972. It contributes to the quality of life of millions of Canadians by identifying shared priorities and coordinating actions to restore and protect the chemical, physical and biological integrity of the waters of the Great Lakes. Canada and the United States, in consultation and cooperation with State and Provincial Governments, Tribal Governments, First Nations and Métis, Municipal Governments, watershed management agencies, and other local public agencies endeavour to better understand the Great Lakes ecosystem, and to restore and protect water quality and ecosystem health. For more information, visit binational.net.